Alfredo led the group in the Four Way Test. Today we had 16 members present as well as one guest, Jane Mitchell, a guest of Sheila Anderson and 2 visiting Rotarians from the Cambie club, Branden Yu and Kwahgo Son. "My only regrets in retirement is my day to day contact with our youth.The first Interact Club for Senior Secondary Students was established by the Rotary Club of Melbourne Florida in the late 60s! The term Interact is derived from inter for international and act for action. Today there are over 15,875 Interact Clubs with more than 151,000 members in 88 countries. A major goal of Interact is to provide opportunities for young people to create greater understanding and goodwill with youth throughout the world. As a member of the Project Amigo Committee I will be meeting with our King George Secondary Interact Program about their engagement in this International Project!" The Rotary Club of Vancouver Cambie invited us to their Korean Thanksgiving Fundraising dinner. It will take place on October 7th at 6 pm in the New Vista Society. For tickets please call Branden Yu at 778 862 9122. 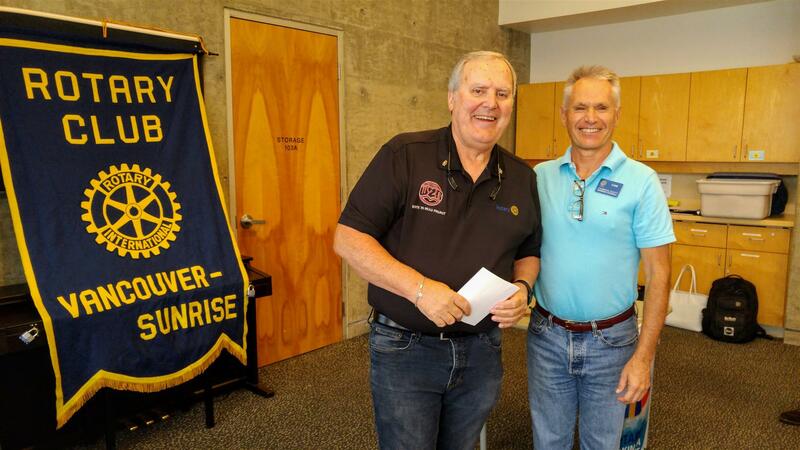 Our guest speaker today was Bob Blacker, Past District Governor and Rotarian for the past 20 years. Bob is a Paul Harris Fellow and member of the District 5040 Paul Harris Society. Bob was born in Australia, moved to Canada in 1971. That same year Bob joined the New Westminster Police Department and retired from the department in 2000 with the rank of Inspector. Today he talked about the "Write to Read" program. Write to Read is a volunteer effort on the part of many individuals who have contributed their time and effort to create a library system for remote First Nations communities in BC. The Write to Read Project delivers books, libraries, computers, tablets & high speed Internet connections to remote First Nation communities in BC. In 1998, Bob became an Honorary Aide de Camp (HADC) to the Lt. Governor of British Columbia. In 2007 His Honour, Steven Point, and Bob started to work together to get books into isolated First Nations Communities in British Columbia. In 2012, after his term as Lt. Governor, HH Steven Point returned to the Bench as a Provincial Court Judge. As a result, Bob carried on as the Project Leader. Both men never dreamt that WRITE TO READ would be as successful as it is today.